This place is a UNESCO World Heritage Site, listed as Independence Hall. 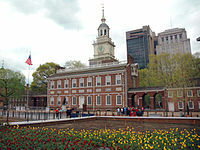 English: Independence Hall — renowned American landmark, within Independence National Historical Park, in the Old City neighborhood of Philadelphia, eastern Pennsylvania. Pages in category "Independence Hall, Philadelphia"
Media in category "Independence Hall, Philadelphia"
The following 200 files are in this category, out of 514 total. This page was last edited on 27 December 2018, at 09:46.